Grand Velas Los Cabos’ new Tequila Sunrise Amenity makes sure guests start their day enjoying one of Cabo’s most brilliant natural wonders. 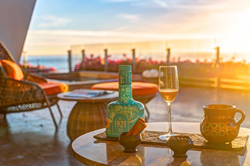 As the sun breaks the horizon in a tight ball before spreading a myriad of reds, yellows and oranges across the sky above the Sea of Cortez, guests can wake up to a pot of coffee with a Mexican twist - 1921 Tequila Cream liquor. Grand Velas Los Cabos’ new Tequila Sunrise Amenity makes sure guests start their day enjoying one of Cabo’s most brilliant natural wonders. As the sun breaks the horizon in a tight ball before spreading a myriad of reds, yellows and oranges across the sky above the Sea of Cortez, guests can wake up to a pot of coffee with a Mexican twist. Upon request, five minutes before the sunrise, suite service will deliver a fresh pot of coffee accompanied by 1921 Tequila Cream liquor and fresh whipped cream for an early morning cocktail sure to start the day right. Native to Guanajuato, Mexico, the tequila cream is made with Blanco Tequila, coffee, milk, cinnamon and anise providing for a uniquely Mexican flavor. All 307 suites at Grand Velas are oceanview with over 1,180 sq. ft. of space, inclusive of a private terrace perfect for enjoying the Tequila Sunrise Amenity and spotting marine wildlife such as the whale migration, from November through April. Rates at Grand Velas Los Cabos’ all-inclusive resort start at $582 per person per night in double occupancy and include luxury suite accommodations, gourmet meals, premium branded beverages, 24-hour in-suite service, nightly entertainment, taxes, gratuity, and more. For reservations or additional information, please call 1-888-407-4869 or visit https://loscabos.grandvelas.com/. The AAA Five Diamond Grand Velas Los Cabos on Mexico’s Baja Peninsula offers the next generation of all-inclusive amenities and facilities with dramatic ocean views and unique spaces infusing every area of the resort. Located between Cabo San Lucas and San Jose del Cabo, the beachfront property features 307 ocean view suites, all over 1,180 sq. ft. with private terraces and some personal plunge pools. Duplex wellness suites have designated fitness amenities, a personal Wellness Concierge and healthy food and beverages in suite. Grand Velas Los Cabos features five gourmet restaurants led by top chefs, including two star Michelin chef Sidney Schutte, complemented by an extensive beverage program and wine based features inspired by the proximity to Mexico’s fine wine region. A staff ratio of 3 to 1; 16,370 sq. ft. convention center with the capability for 20 breakout rooms; 35,000 sq. ft. Se Spa with 16 treatment rooms and hydrotherapy facility; three pools; and pool and beach concierges are available. Rounding out the list of amenities and services are a Technogym Fitness Center with personal trainers, exercise programs, yoga, Pilates and meditation; recreational activities program; separate teens’ and kids’ club facilities and activities program; 24-hour personal concierge service; baby concierge; and 24-hour in-suite service. Opening soon, a gallery of contemporary art will continue the company’s commitment to bringing the art, fashion and culture of Mexico to guests. The curved, half-moon design of the hotel catches eyes along the corridor with an iconic grand entrance that’s open air, three stories high and over 300 ft. above sea level. All of this beachfront, just 35 minutes from the Los Cabos International Airport which directly services over 40 destinations in the United States, Canada and Latin America. A member of the Virtuoso Hotels & Resorts Program, Grand Velas Los Cabos was built and is operated by Eduardo Vela Ruiz, founder and president of Velas Resorts, with brother Juan Vela, vice president of Velas Resorts, by his side. For reservations or additional information, please call 1-888-407-4869 or visit https://loscabos.grandvelas.com/.